I recently went on a trip to Alaska. While it was only for a few days and I didn’t see as much of the aurora as I had wanted to, I still had a great time. 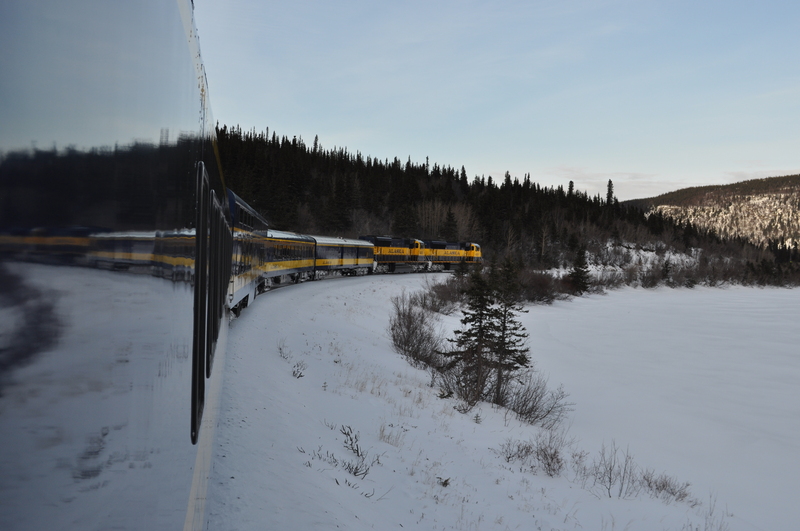 One of the best parts of it for me was the Alaska Railroad – the 356 mile stretch between Anchorage and Fairbanks, to be specific. 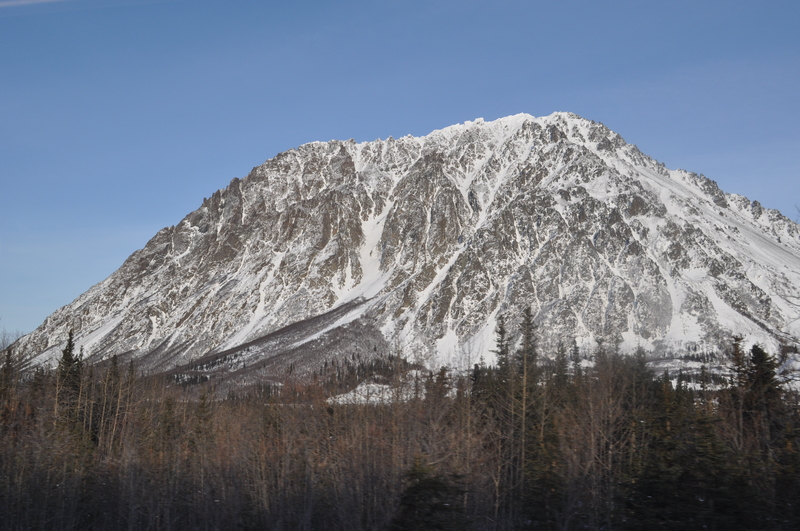 It is an 11.5 hour ride starting at 8:30am in Anchorage and well worth it. The train itself is diesel-powered and quite smooth. There were four carriages behind two locomotives with a bistro car and dining car in between. A full menu was offered with simple snacks in the bistro (with table seating for those who wanted it) as well as sit-down means in the dining car. The menu for breakfast, lunch, and dinner was extensive enough to be worth it. Plus, the novelty of eating on a moving locomotive was pretty well worth it. I only had the pot roast for dinner but it was quite tasty. And, the fact that you are put in “festive seating” with whomever makes up four people in your party adds an element of surprise fun. 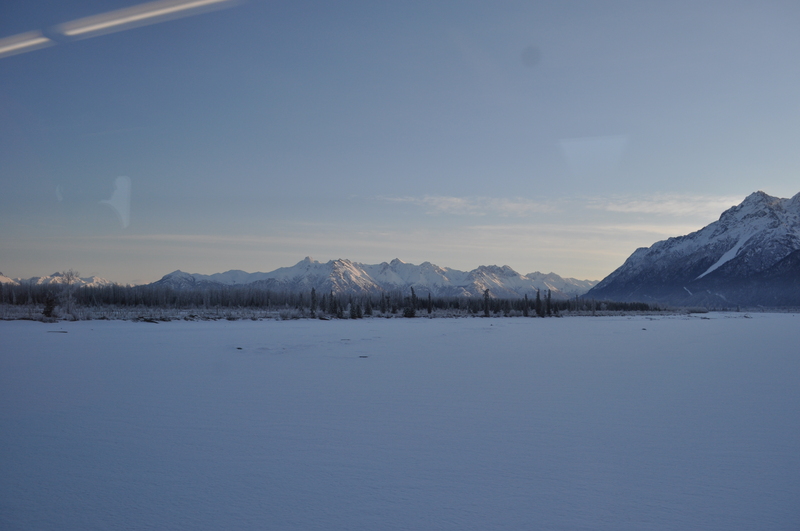 My trip started at the train depot in Anchorage at 7:30am when they told us to arrive. I had printed out my confirmation in advance but didn’t realize until around 8am that I had to convert that to an actual ticket at a will-call window. I’m glad I did otherwise they would not have let me on the train. That being said, all seats were reserved anyway and I had luckily put in for a window seat months ago. That means I had beautiful views of the surrounding trees, mountains, and sun. And these are just some of the photos I took towards the morning. Unfortunately, there was no official “viewing car” because, apparently, in the winter it can freeze over and break the windows. 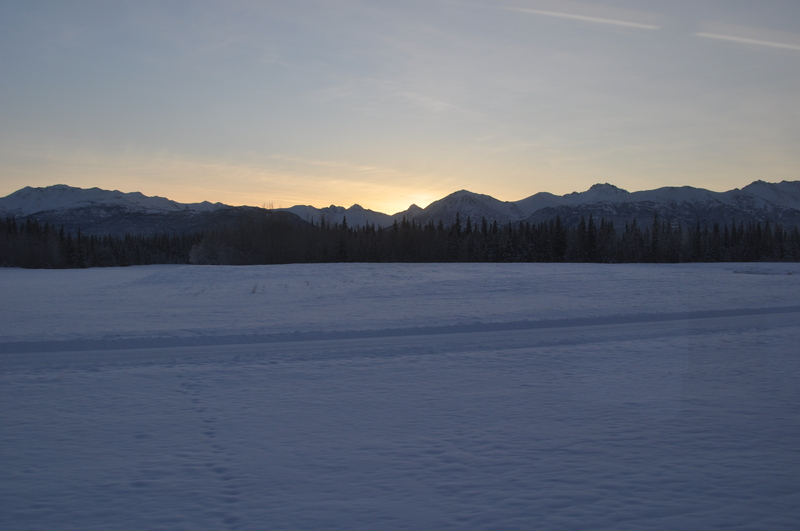 I loved the photos I took of the sun creeping up behind the enormous mountain ranges. 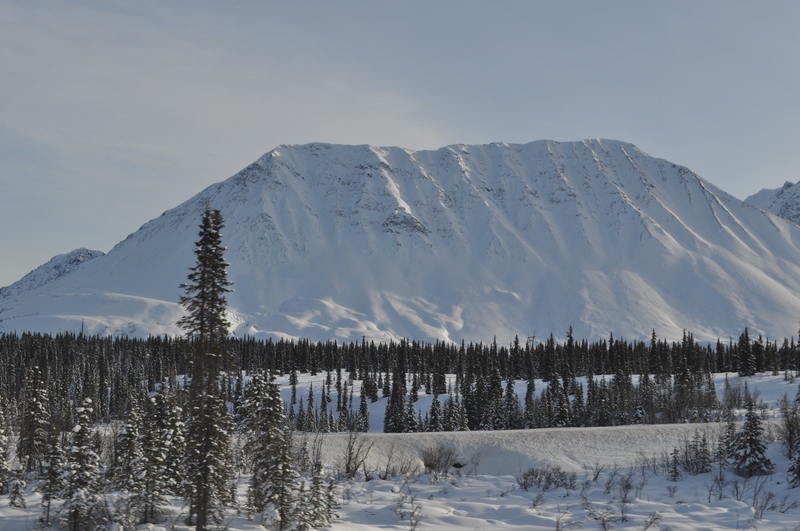 I honestly forget what these ranges are called (probably “Alaska range” or something like that) but I do know they were super pretty. I sat next to a random gentleman who grew up in Atlanta, Georgia but was living in Dallas, Texas currently. We struck up a conversation quickly because he was so personable he bought me an iced tea from the bistro! It was quite nice. 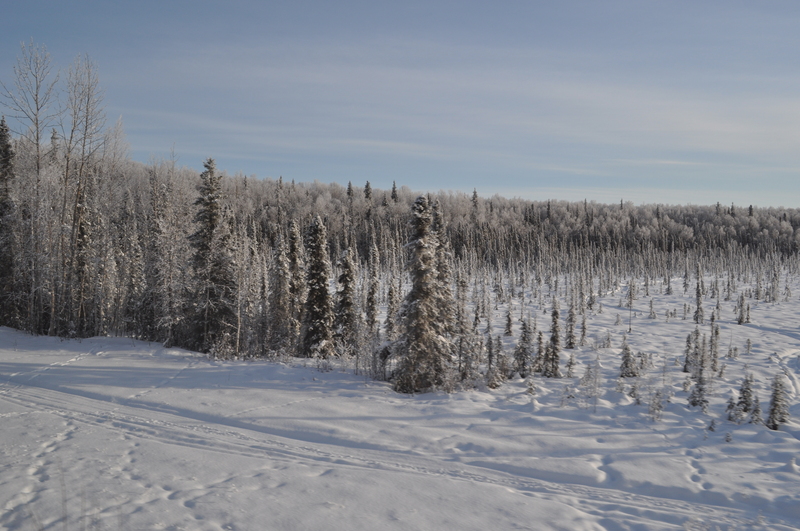 Except for some meals and a nap along the way, we chatted almost the entire way to Fairbanks. Can you imagine about 10 hours of conversation – we talked about everything. It was quite fun. 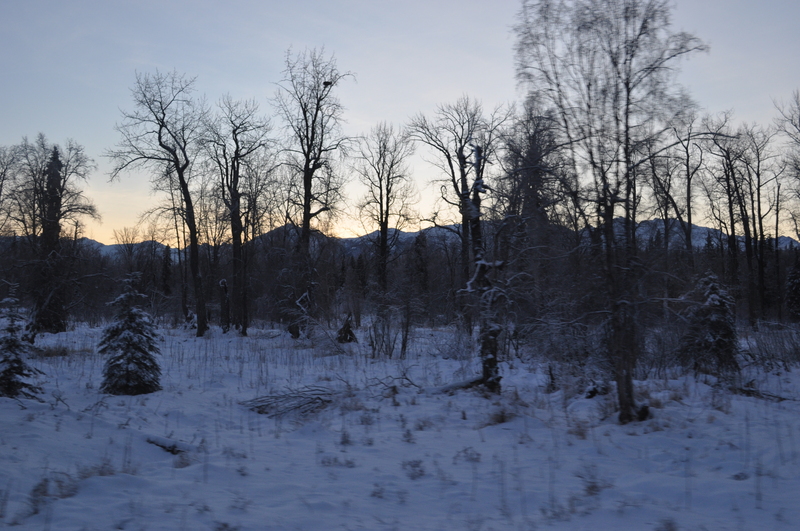 Eventually, we got a glimpse at some other natural wonders as the sun rose (but only a little bit as we were near the Arctic circle – so cool!). 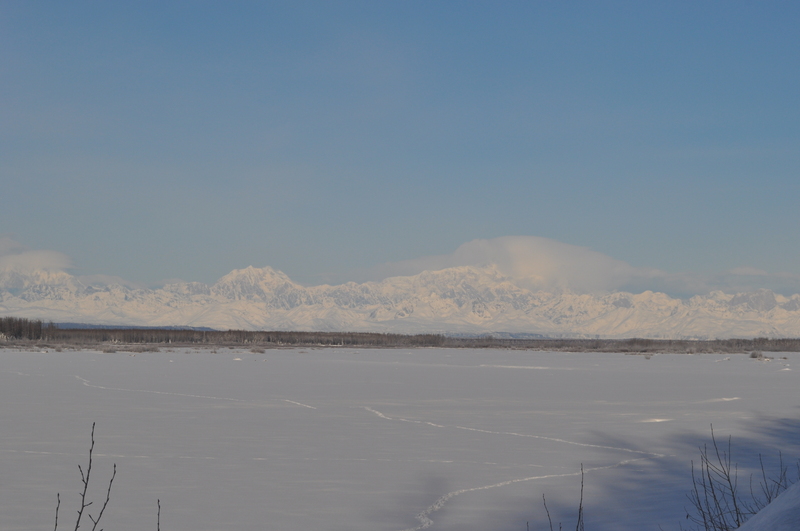 We saw some clouds covering Denali (a.k.a. the mountain formally known as McKinley) and I got a few shots of the train going over a bridge and the train turning around a corner. Throughout all of this the conductors were sharing information about the mountains, the valleys, the rivers, the towns, and all the population in between. It was quite interesting to hear that in between major stops people who lived out there were able to flag down the train for free rides to/from wherever they wanted. 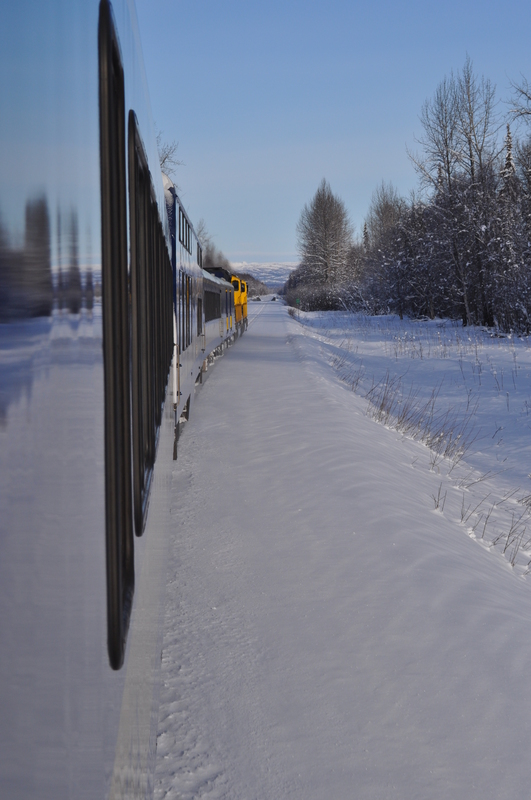 Apparently that was a deal brokered years ago because the Alaska Railroad is the only way to get there/back (i.e. there are no roads). This wouldn’t be a review without me talking about comfort, however. The seat was quite comfortable and had a lever for pitching back during my nap. The only major criticism is that there was no tray table – this would have been useful for people (like me) who bring their own food in order to save on cash. Additionally, while there were power ports here and there, they were not at every seat. The conductors did point out that they had USB-specific power ports in each car, which was a nice offering, but there could have been more charging capacity. The bathrooms were quite clean and efficient. They had running water and enough toilet paper and paper towels to last the entire trip. And across from each of them was a setting of brochures and things to help us learn more about our surroundings and get ready for our time in Fairbanks or Anchorage (or Denali, in between). One of the other nice things was that we could stand between cars in order to take some photos without the glare of the windows. That was important at certain times of day when you wanted that perfect photo of the outdoors but couldn’t get it without that stupid fluorescent light showing up in the window. 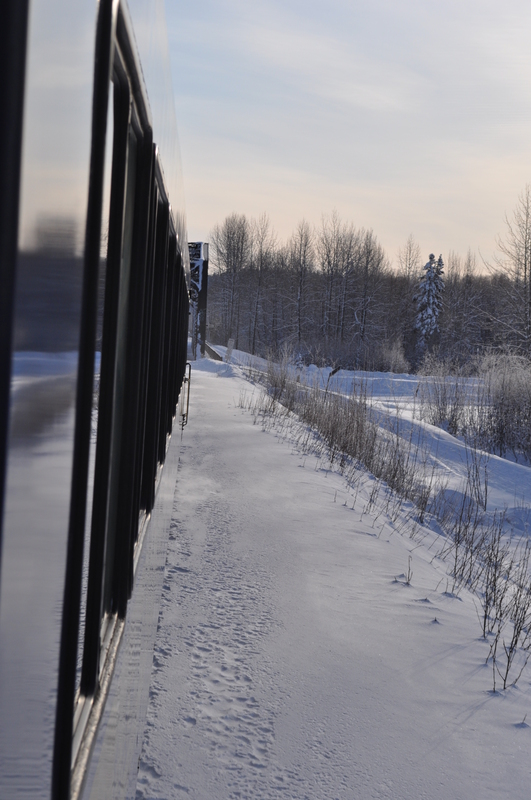 When we finally got to Fairbanks the train stopped at the depot and there were masses of buses there to pick up groups of passengers on trips. I was able to call ahead to reserve a cab and take myself right to my AirBnB. All in all, it was a great train ride. I highly recommend spending the money to do it.